Imagine walking in the city in a hot burning summer day. The asphalt under your feet is boiling, the car traffic is adding to the density of heat and pollution and the whole urban structure becomes a heat sink squeezing even more sweat out of your body. And now imagine this: same day, same city, but you are walking under a green shady canopy, not of trees, but of algae, that cools the air around you, produces the amount of O2 that a small forest does, clean the air, and create an amazing amount of biomass per day that can be used either for bio-fuel, as food or in many other ways. This concept was just translated to reality by the ecologic Studio. 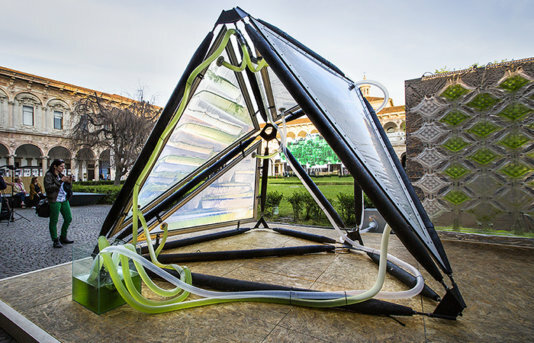 The Urban Algae Canopy can be best described as a piece of bio-digital architecture that combines micro-algal cultures and real time digital cultivation protocols. To be displayed at Expo Milano 2015, the structure is able to control the flow of energy, water and carbon dioxide based on weather patterns, visitor's movements, and other environmental variables. It's the first of its kind in the world, and once fully completed, the canopy will be able to produce the oxygen equivalent of four hectares of woodland, along with nearly 150 kg of biomass per day. Let’s take a closer look at that number. 4 hectares are 40 thousand square meters. That’s the equivalent of 4 football (soccer) fields! The functioning principle of the prototypes is based on the exceptional properties of micro-algae organisms, which are ten times more efficient photosynthetic machines compared to large trees and grasses. The façade and canopy currently being developed for EXPO Milano 2015 develop a natural man-made ecology and explore the use of algae as an integrated architectural cladding and urban agriculture system. Algae can represent an important part of creating a healthy and liveable planet. Giving life to mysterious urban gardens, algae can be used as an innovative energy and food production system within our cities. This intersection between technology and biology means that when the sun shines more intensively, the algae would photosynthesize and grow which in turn reduces the transparency of the canopy and provides more shade. With micro-algae as the foundation of the canopy, it is inherently responsive, which means visitors will be able to influence the building’s behavior in real-time. At any given time, the transparency, color and shading potential of the canopy will be the product of the interrelationships between climate, micro-algae, visitors and digital control systems. Micro-algae perform an important photosynthetic activity, absorbing considerable amounts of carbon dioxide and producing oxygen, and growing into a biomass, which can be processed for energy, cosmetic, pharmaceutical and nutritional markets. Micro-algae open up an incredible potential for new renewable energy resources, and hope for a greener future. Building and architectural surfaces are an incredible resource of space. Urban façades and roofs represent billions of square meters that instead of being made of an inanimate material such as concrete could become clever photosynthetic surfaces that respond to the current state of climate warming. Micro-algae could add to the green urban system that exists already, intensifying carbon dioxide fixation activity and acting as cladding for buildings, increasing their passive performance. 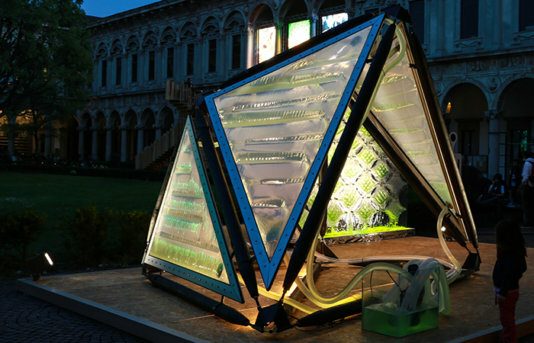 Will micro-algae urban farming become part of our future? According to this prototype and studio, it seems so.